Released on this day in 1980 was the film The Empire Strikes Back. The second installment of the original Star War trilogy, features the debut of one of the most memorable characters in the history of science fiction: Yoda. Although small and unimposing in appearance, Yoda is a wise and powerful Jedi master who trains Luke Skywalker in the ways of the Force. 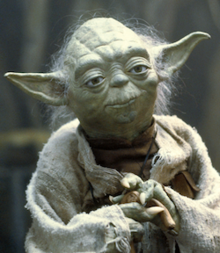 Just as distinctive as Yoda’s appearance is his manner of speaking. Yoda’s syntax might seem alien, but it’s not. Generations of writers, especially poets, have used the rhetorical device called anastrophe (or inversion) to rearrange the syntactic furniture for effect (Anastrophe in Greek means “turning back or about.”). Using something other than the usual word order, makes the reader slow down a bit and spend a bit more time pondering a phrase or a clause. Anastrophe also allows writers to add emphasis to a particular word, just as you might move your sofa to a more prominent position in your living room. The question is: to be, or not to be? What are some of the most famous quotations in the English language? Brainstorm some famous quotations. Then, try your hand at applying anastrophe by changing the word order of at least three separate quotations. You can change the word order any way you like, as long as make sense it does.